Ian Quick spent 8 years practicing law. Then it occurred to him he hated his job - "it's just one of those things where the practice and the theory are very, very different," he now observes. So one day before his 30th birthday, Ian quit his job as a corporate lawyer to become ... a magician - a craft he had practiced part-time for years until he decided that it was his true calling. To improve his skills, Ian found a coach, Elliott Smith, whom he credits with transforming him from an amateur into a seasoned professional. 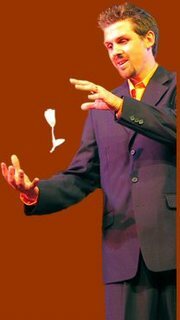 Now with his own magician's website, Ian is having a blast performing at private and corporate parties, tradeshows, and on casino stages. He says his income is approaching six figures - equal to his former salary - but instead of working 60 hours a week, he now works 15 to 20 hours a week. He has even had time to colloborate with Smith on a book - Highway to Success: The Entertainer's Roadmap to Business - intended to help other individuals with unique talents launch an entertainment career while following sound business practices. See the full story here in the Edmonton Sun online edition.